In order to write this review, I have to tell you a personal story. Back in my early 20’s, having come out of a church tradition that was not Reformed, and to be honest, somewhat anti-intellectual, 6 of us jumped in the car one Saturday morning to drive from Rochester, NY – about 2-1/2 hours, to Herkimer, NY. A sleepy little town in Upstate NY, Herkimer was also home to a Reformed Baptist church (I didn’t know what that was at the time) pastored by Fred Heubner. There, in the balcony of Fred’s church, was the seed of what a lot of us know today as Cumberland Valley Bible Book Service. Back then, it was just Fred’s passion to get the best Puritan and Reformed literature he could into the hands of likes of these 6 yahoos. We had begun the quest. We were soon to be junkies. And Fred was our Pusher. Stepping, pawing and drooling over stacks of books, commentaries and other publications, the likes of which I was certain belonged only to a by-gone era; Pastor Heubner patiently listened to and answered the questions of these reformational neophytes – gently guiding and explaining as we went. We had come to buy. Each had set extra bucks aside for this literary excursion. And there was SO much. What to buy? What would do me the most good? What would I get the most mileage out of? I wanted to get a grasp of Reformed theology – a base, a system. And then I saw it. Glistening in all of its shrink-wrapped glory. A little 3-volume, hardback set with these imposing words on the spine in golden ink “Dogmatic Theology”, “Shedd.” “How ’bout this?” I asked Pastor Heubner. He smiled the smile of a man who knew I had bitten off too much, but that once I had gotten the taste in my mouth – I just wouldn’t be able to spit it out. To be completely frank, no one set of writings has ever impacted my life as much since. Nor do I think any will. 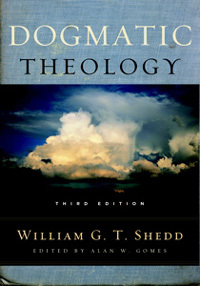 Which is why I will really begin my review with this statement: Alan Gomes has performed a service of incalculable value to the body of Christ in the editing and re-issuing this incomparable work – Shedd’s Dogmatic Theology. I cannot tell you how many times over the years I have encouraged young men looking to truly master theology to read Shedd. And up until this new edition, Shedd’s Dogmatics had been pretty much out of print since the 70’s. I was always lending my copies and counseling others to keep their eyes open for sets wherever they could. One company photocopied them and I think they owe me a huge commission for the number of sets I sold for them. What rests between the covers is a rare confluence of engaging literature, sound doctrine, riveting logic, Biblical philosophy and scientific exegesis. Shedd, to say the least is solidly Reformed. Some have argued he stands second among the greatest of the American Theologians – Edwards occupying first place, and R. L. Dabney the third. But for accessibility, lucidity and usefulness, I personally set Shedd at the head. What I discovered, and I hope so many of you will discover, is the thrill of reading well organized, exquisitely argued theology from someone who both loved his subject, and the art of communicating it in writing. These qualities make him immensely readable, even though his 19th century prose sometimes requires a second take. He loves truth. He loves Biblical truth above all. And He loves to make it understandable, reasonable, and cohesive. Gomes writes: “Shedd’s value for the modern student. Careful study of Shedd’s Dogmatic Theology is, I dare say, much more than an intellectual exercise: it is an esthetic experience for those who appreciate the comeliness of truth. If truth is beautiful in itself, then Shedd’s vigorous and stately prose sets before us incomparable beauty beautifully expressed.” I agree. His balanced, insightful and wonderfully reasoned section on Vicarious Atonement is second to none, and served to rescue me from the throes of the hyper-Calvinism which is often rearing its ugly head these days. It is worth the purchase price alone. His work on endless punishment and Hell, in a day where both are challenged from virtually every corner is compelling, convincing and in my judgment – definitive. Yes, he tends toward supralapsarianism and traducianism. Live with it. Even when you disagree, you come away respecting the how and why of his positions. And for a thorough analysis of why various false doctrines break down logically and Biblically, his style of extremely tight reasoning makes him a study in learning to think better. He will make you think better. Born in 1820 in Massachusetts, William Greenough Thayer Shedd pursued academics and taught first in New York City. Converted during that year, he then entered Andover Seminary and ventured upon the Pastorate. Later, he would co-labor with Gardiner Spring at Brick. Throughout his career he served as a professor of English literature; professor of sacred rhetoric and pastoral theology (Auburn Theological Seminary) and professor of New Testament literature and Systematic Theology at Union Theological Seminary. What makes Shedd’s Dogmatics sing though, is not as much his erudition, which is evident on every page, but the fact that he was a preacher in his own right. (You should also check out his twin volumes “Sermons to the Natural Man” and “Sermons to the Spiritual Man” – recently republished by Solid Ground Books) So it is his work here, even though at times minutely technical, has a preacher’s ring to it. I seldom go more than a week without referring to something in Shedd. This is a priceless resource. All that being said – and doing my best to avoid hyperbole (though some I’m sure will disagree), what Gomes has done in his masterful re-work, amounts to Shedd on steroids. This new edition has extraordinarily useful features I had only dreamed of. First, I have to note that Gomes gently modernized things stylistically (capitalization, punctuation, archaic spellings, etc), without any abridgement or paraphrasing. He added a much needed biographical sketch of Shedd. I say “much needed” because nothing BUT biographical sketches exist on Shedd today. There are no full biographies extant. So this becomes valuable in it own right. Third, he has added two very useful glossaries. One for terms Shedd assumes you should already know (the various “isms” of Church history for instance – talked to anyone about Nestorianism lately?) The second is a biographical glossary giving you sketches on the various people he cites – who are both myriad and unfamiliar to most modern readers. The fourth great feature is that all 3 volumes are synthesized into one. In the original set, the 3rd volume was a collection of miscellaneous citations, expansions and references to material in the first two. Now, the contents of volume 3 have been woven into the main text. This is just superb. Fifth, Shedd’s writing style tended to omit subdivisions in his arguments -Gomes painstakingly supplies them. No easy task at all. And lastly, because Shedd was at ease supplying us with quotes in 5 or 6 different languages, Gomes knows WE aren’t so conversant and mercifully translates them for us. Huge help. One last BIG feature. You see, I haven’t purchased this new hardback version myself yet. I can’t get over my fear that somehow I’m betraying the purist in me. And even though my bindings are broken, my notes smeared, and more is now underlined than not – It was my first. I can’t give it up. So what? So now, it is available in electronic format. That I DID purchase. As soon as I possibly could. The ability to do word searches, highlight, and cut and paste make it transcendent. Look, I’ve got Hodge. I’ve read Hodge. I love Hodge. Same for Berkhof. And a couple of others. Give me Shedd – any day. Shedd crystallized and systematized theology for me, and then made me love philosophy. He made me think of God and Christ and salvation in noble and uplifting ways few others can – period. No small tasks. And that, all the while inviting me to read and think and reason more and more. I owe him a debt I can never repay, a debt happily increased by Dr. Gomes exponentially. Buy Shedd. Read him. You will NOT be sorry. Dr. Gomes, from the bottom of my heart – THANK YOU!